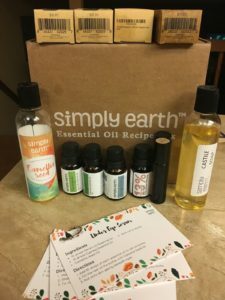 Simply Earth subscription boxes are $39 per month. Both boxes I have received have paid for themselves in the oils alone. They also share 13% of their profits with 5 stones which works to fight human trafficking! Simply Earth also does GCMS testing on all their oils. Use the code CrazyLifeAsMomfree with this link. after your first box you will get an emailed code for $40 off your next purchase! (updated since review was published). 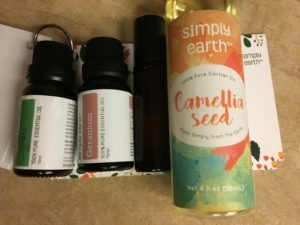 Simply Earth’s Natural Beauty box for May comes with camellia seed oil, Castile soap, two 10 ML bottles, labels, recipe cards and 4 oils (Juniper berry, cypress, Geranium and lemon grass). The recipes are for body wash/shampoo, conditioner, eye serum, makeup remover). First off I will review the items I made with the ingredients above, and then give a bit of info on the ingredients. Third recipe was the Makeup Remover. Camellia seed oil is traced back to ancient China. It is also known as tea oil (not tea tree Essential oil) and is a great carrier oil. Its shelf life is 1-2 years. I do not find it greasy at all and its lightweight and soaks into the skin very quickly. To me is smells like a green tea so it’s a very mild scent and should not affect the oils you use to make your products. Its known for anti-aging, immunity, heart health and topically for hair and skin. 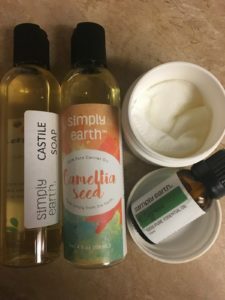 Camellia seed oil is high in antioxidants, omega 3, Vitamin A,B,C, D and E.
Castile Soap is traditionally an olive oil based soap. It is often seen in liquid form, but is also made into a bars as well. I have used this in distilled water with Tea tree essential oil to kill sugar ants in the spring. Juniper Berry is an anti rheumatic and can improve blood circulation and reduces swelling. That is why it is used in the eye serum recipe this month. It has been said to be an astringent which can help with tightening loose muscles. It is diuretic so helps with accumulation of water (especially under the eyes) and can help removing toxins from the body. Cypress is typically used to help congestion of the lymphatics, help blood flow. PMS/menstrual issues, Detox, help water retention, and relax muscles. Its even been said to help reduce cellulite and reduce pores. This is due to it being an astringent. It is also an antiseptic so it can be used in healing sprays to help with wounds. Geranium appears to be used a lot in skin products. Historically that is what the Egyptians used Geranium for. Now it is said to treat acne, reduce inflammation, help with anxiety, help balance hormones, and benefits the skin by being an astringent. Lemon Grass is a great oil and one of my favorites right now. I have read that it is supposed to help muscle pain, kill external bacteria (maybe all those nasty kid shoes? ), help keep insects away, help with body aches and your digestive system. It is used as an antifungal (hello summer kid shoes), insecticidal, antiseptic and anti-inflammatory.